We said early on that we'll base our views on Dr. Frank's books that will be updated as necessary. Dr. Frank, who was thorough and careful, noted the two wives of Thomas. Since then, the matter is still open to interpretation. 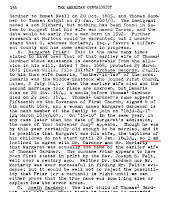 Irrespective of her last name, Margaret is most likely Thomas' first wife and arrived with him and their kids on these shores. The Great Migration leaves it open, as do other genealogy works. Remember, genealogists have lead feet. We don't. The studies, to which people point, all reference TAG 30:156 which does not make a definitive statement about the matter. The argument is that a church record of 1639 has Margaret showing up. Consider, Thomas may have shown up at the Church in 1629, but he didn't deign to show up to be a freeman until 1637. Margaret may have decided to join much later, for the future of her family who did turn out to be successful in their own right. Margaret was definitely ahead of her time and needs more attention to be given to her life. Now, there is also a suggestion, in these studies, of a death of the first wife with Seeth's birth. This is not documented. It's pure speculation, folks, as far as we know (to wit, Great Migration, et al). TAG 30:156 does not tell us to not refer to Margaret. The matter is open until there is further information that can be documented. In the meantime, we'll honor Margaret, with Thomas, as our ancestors. 08/01/2018 -- The past few days, I have been on WikiTree. 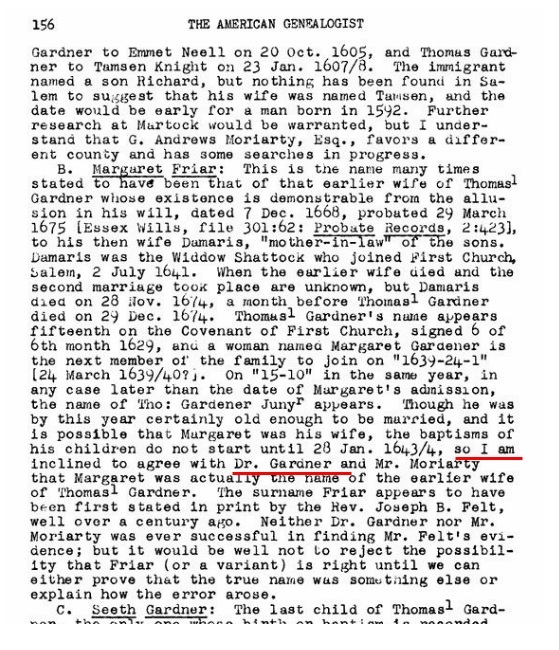 We are looking at settling issues for the profile of Thomas (and his spouses): https://www.wikitree.com/wiki/Gardner-159. These profiles are being set up and maintained by the Puritan Great Migration. Expect an update blog post within the next day or so. Notice the recent comments (the 'unknown' is because I juggle many email accounts and was in the wrong one - it's not that I'm old). 12/31/2013 -- See Remarks, this day, in the How many wives? post. In that Remarks, we see that Anderson, et al, have the wrong year and age for Richard. 11/27/2012 -- We visit the theme, one more. Anderson didn't leave it open. He actually made a hypothesis and stated a proof for his thoughts about a third wife. However, we don't agree with his analysis and will pursue the matter further. 09/25/2012 -- Added in a snap of TAG 30:156 (George E. McCracken, Ph. D.) with red markings about the author saying that he would continue to agree with Dr. Frank. So, we can, at least, call her by her first name, even if we can't say for sure what family she was born to. There is a question pending (comment earlier, sorry about the delay, will work a process to respond to comments) about George's wives which is covered in the same article. We'll look at that. We posted earlier about George's daughter, Ruth. ..., Also, added the emphasis below. TAG 30:167 covers the 'flight to Connecticut' which had been a mystery to me. Expect a further post on TAG 30 after I've had a chance to digest its contents and to study its motivations (and see what Felt and Moriarty were saying). 09/16/2012 -- Of course, another reason that Margaret may not have been at church could be her maternal duties. 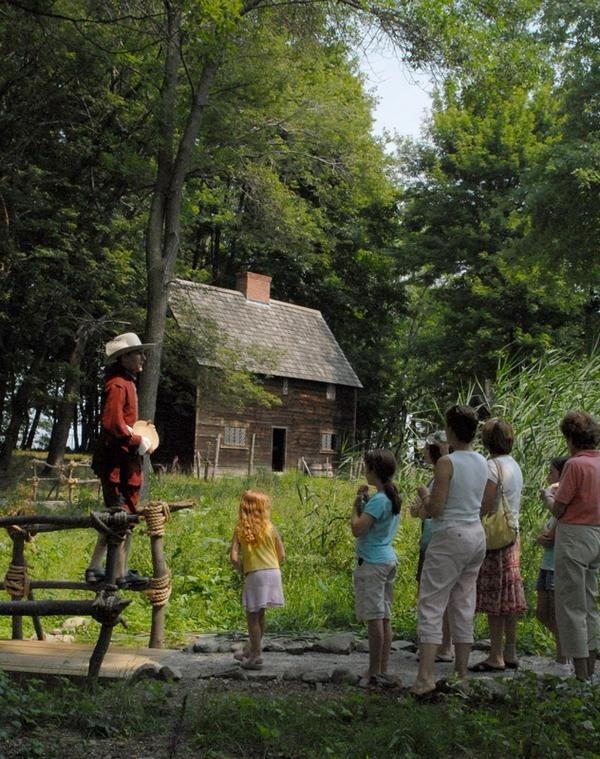 I've not seen any depictions of kids in Puritan gatherings, except for older ones. Margaret, throughout the period of interest, had several young ones to care for. And, Thomas would have been there protecting them. Ideal couple, so to speak. One goal of the Thomas Gardner Society will be to collect, and hopefully organize, material that references, even if indirectly, the lives and time of Thomas and Margaret and to construct a coherent view for future generations. However sketchy this material might be in the beginning, future research can help flesh out the story. The works of Dr. Frank A. Gardner, and prior work, by others, establish the basis. Gardner's Beacon, and its corresponding blog, has tasks related to supporting this theme. Another approach would be support for scholarly papers. We have our first guest article written by John Goff who is an architect and who has been very active in preservation efforts across New England, principally Salem. He is a Thomas descendant. John provides technical commentary on the Gardner-Pingree house (see earlier post) whose construction represents the amount of wealth that had been attained by the Gardners. As we look back, there can be obvious differences of opinion about what information means, especially, if it's scanty. Scholarship would suggest to look at all sides of the issue. There are several examples. The house built on Cape Ann, called the Governor's Faire House (GFH) by Rev.Higginson, is a good example. Earlier (Thomas' (note comparison to a house in the Pilgrim area) or Margaret's house), we used an image provided in the 1887 book by the Conant family (pg 104). 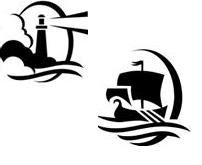 The house had been moved by Endicott from Cape Ann to Salem. That means that many would have seen it and could describe what they saw to an artist. In 1930, Dow, et al, built the Salem Pioneer Village so that people could see how things were 300 years before. We have the 400th look back coming up. The image on the right (photo by John Goff, Salem Preservation, Inc.) shows how Dow conceived the building. It does not match up with what the Conant book said. Of course, any information about dimensions may have been hard to find. Yet, one could imagine that the ship(s) may have carried material for a house, as depicted by Conant. There would not have been enough time, even with tools, for even the house of Dow to be built, given the small size of the crew plus the fact that they had to get themselves settled, fed, and a whole lot of other important things. What did Dow go on to make his re-creation? John Goff mentions that the GFH towers over the other houses which are mostly either diminutive English timber frame cottages or English wigwams built with bent-sapling frames. See Vol. II, No. 4 of Gardner's Beacon which considers some of the houses that have been associated with the Gardner family over the years.This issue on houses was interesting; our coverage of the topic ought not be thought of as complete, by any means. 03/09/2019 -- Added in image to build an index at our portal to truth. 10/27/2012 -- See Great House (Cape Ann) on Wikipedia. As Higginson said, it was two-storied with a high-pitched roof. The image from Conant's book, and from the letter by C.M. Endicott, shows three-stories. The house underwent major alterations in 1792 which was before the sketches were done. Unfortunately, no sketch exists from earlier times. 09/12/2012 -- It was said that we're not done with houses. Fischer notes, in Albion's Seed, that the lean-to was found in Kent, England in the 17th century, though not many have survived. Despite its usefulness in New England, evidently the 'seed' for this type of house came over with those whose background was from the Kent area. 09/11/2012 -- The Stone & Fickett book has the younger student in mind and provides classroom exercise. Ought something similar be done for later students?